S&W's new Night Guard revolver line is just the ticket for personal protection. The Night Guards come in (top to bottom) N (329NG), L (386NG) and K (315NG) frame sizes. Readers familiar with my scribblings are aware that I am a proud member of an ever-shrinking fraternity: a revolver fan. While I own a large number of semiauto pistols and use them for competition, concealed carry and home defense, my true love has always been the wheelgun. And when it comes to carry guns, I'm a firm believer that "light makes right" because any handgun that is carried for self-defense is going to be toted around a lot more than it is ever going to be fired. For these reasons, one of my regular carry guns is a 1960s vintage S&W Model 12 AirWeight--a K-frame alloy revolver that weighs a mere 18 ounces but holds six rounds of .38 Special ammunition. Unfortunately, the Model 12 went out of production in 1986 and is not rated for +P ammo, and while there is no shortage of lightweight, alloy-frame revolvers on today's market, almost all of them are small-frames that hold only five rounds of ammunition. Recently, though, Smith & Wesson introduced a new line of revolvers that I feel are the natural descendants of my beloved Model 12, combining superior ergonomics, higher cartridge capacity and authoritative calibers: the Night Guards. Night Guard revolvers will be available three frame sizes and five calibers. The Model 315NG is built on a K frame and chambered for the.38 Special. The Model 386NG (a seven-shot .357) and Model 396NG (a five-shot .44 Special) are both built on the L frame. Rounding out the line are three N-frame guns: the Model 386NG (eight-shot .357) and the models 329NG (.44 Magnum) and 325NG (.45 ACP), both of which have six-round cylinders. All six revolvers feature 2.5-inch barrels, matte black finishes and Pachmayr Compac grips. In fact, when you lay them side by side, despite their different frame sizes, calibers and capacities, they look remarkably alike. Differentiating between them is made even more difficult by the fact that their weights are so similar--running from the Model 315's 24 ounces to 29.5 ounces for the big .44 Magnum. Okay, I can already hear the gasps of disbelief from some of the readers, "What? A 29.5-ounce .44 Magnum revolver? Ouch!" Please reread what I said about concealed-carry guns: light makes right. All Night Guard Revolvers are built around a frame constructed from an alloy containing a small amount of scandium. Scandium is a rare, extremely strong and expensive metal that has the ability to transmit a large amount of its strength and flexibility when small amounts of it are alloyed with other metals--aluminum, in this case. The discovery of this process has allowed S&W's engineers to construct ultra lightweight revolver frames that are capable of standing up to the operating pressures of magnum cartridges. scandium in their frames, the Night Guards differ from S&W's other alloy revolvers in that there is a replaceable blast shield made of thin, hardened steel above the cylinder/barrel gap so as to prevent the hot, powder gases from eroding the frame's top strap. While it would have been possible to fit the Night Guard revolvers with titanium cylinders and reduce the weight even further, it was decided that this would increase recoil and might keep owners from practicing with the gun--not a good thing for a personal/home protection firearm. For this reason they are fitted with heavier stainless steel cylinders with a high-tech Physical Vapor Deposit matte black finish that provides increased protection against salts, solvents, abrasion and just about anything that Ma Nature--or careless owners--might care to subject them to. The Night Guard's barrel is a two-piece affair consisting of stainless steel inner rifled tube and an alloy shroud that houses the front sight. Another area where the Night Guards break ranks with their brethren, and tradition, are the sights. The front consists of an XS Sight Systems 24/7 Big Dot tritium night sight. The 24/7 suffix indicates that the tritium insert is surrounded by a large, white ring that make the front sight equally visible in the dark or bright daylight. For a rear sight Smith & Wesson chose the unique Cylinder & Slide Extreme Duty, which is a fixed unit featuring a generously proportioned U notch. This setup provides a sharp, fast sight picture and alignment under a variety of light conditions, rapid target acquisition and transitioning between multiple targets. They may just be the most practical set of revolver sights that have come down the pike in a long time. The Night Guard line includes several other recent S&W innovations: a frame-mounted, spring-loaded firing pin; smooth trigger; checkered hammer; key-operated Internal Safety Lock; and a two-component barrel consisting of a inner, rifled steel tube covered by an alloy shroud. This latter feature permits the barrel to be mounted in the frame and barrel/cylinder gap set without exerting undue stress on the frame. Caliber .38 Special .357 Mag./.38 Spl. .44 Mag. Weight 24 oz. 24.5 oz. 29.3 oz. Barrel Length 2.5 in. 2.5 in. 2.5 in. Overall Length 7.0 in. 7.63 in. 7.75 in. Width 1.5 in. 1.6 in. 1.7 in. S&W provided me with three samples of the Night Guard revolvers to test for Handguns: the .38 caliber Model 315NG, a .357 Model 386NG and a .44 Magnum Model 329NG. I was especially taken with the Model 315NG as it reminded me so much of my Model 12. While their trigger pulls were on the heavy side, backing off their mainspring adjustment screws a few turns smoothed things out considerably without compromising cartridge ignition. Fit, finish and the quality of materials were all self evident, just what I expect from Smith & Wesson. Gathering together a selection of .38 Special, .357 Magnum, .44 Special and .44 Magnum ammunition, I called my shooting buddy Rusty Rawsen--a USPSA state revolver shooting champion--and asked him to meet me at Trigger Time Valley, a professional firearms training facility in Carthage, North Carolina. sights proved equally adaptable to paper punching as defensive purposes, and all three guns printed close enough to point of aim to please the two of us--and that ain't always easy. After chronographing the 10 types of ammo we proceeded to run the revolvers through a series of offhand drills on D-1 targets placed out at five and 10 yards. Safariland had kindly provided holsters suitable to these endeavors. The 315NG proved a regular pussycat to shoot, and my opinion of it kept going up and up. At the other end of the spectrum, shooting magnums out of the 386NG proved a real trial, eventually becoming painful--so much so that Rusty and I ended up using .38+P ammo for most of the drills. While all three possessed equally fine ergonomics, sights, grips and trigger pulls, I thought it best to go over each revolver individually. The Night Guard's rear sight is the rugged Cylinder & Slide Extreme Duty fixed U notch, which can be replaced and fitted with an adjustable S&W sight. The Model 315NG turned out to be my favorite. It possesses the positive features of my old, trusted Model 12--light weight, compact size and a six-round cylinder--while featuring improved sights and grips for superior accuracy and recoil control, along with the ability to use +P ammo. While some of today's "experts" belittle the .38 Special as a defensive round, I firmly believe that if you can't handle the situation with six rounds of .38 +P you don't need a handgun. You need a SWAT team. The 386NG is only slightly larger than the 315NG and would serve equally well for concealed carry. I have used a pair of L-frame 686 revolvers for action pistol competition for almost two decades and believe this size revolver provides an optimum combination of size and weight for fast, serious shooting. And there's not a damn thing wrong with having a seventh round of ammo either. The downside is that, because of its light weight, the recoil generated by magnum cartridges has a negative effect on accuracy and the ability to make fast follow-up shots. My advice would be to use .38 +P ammo. While some favor them, I have always found N-frame revolvers a bit too large for me to shoot comfortably, and I feel that the 329NG is a too large for the average or even "above average" person to carry concealed. However, if used for home defense, its size would not enter into the equation. In addition, Rusty and I both found that firing .44 Magnum cartridges out of it was, well, a painful experience. If I were to use it for defensive purposes I would stoke it with .44 Specials and reserve magnum loads for those times when it would serve as a trail or backup gun for hikers or hunters in bear country. Despite the popularity of semiautos, there are a significant number of law enforcement officers, homeowners and licensed civilians who still prefer the revolver, and this is the market niche that S&W sees for the Night Guard revolvers. And, excuse the pun, I believe they are right on target. 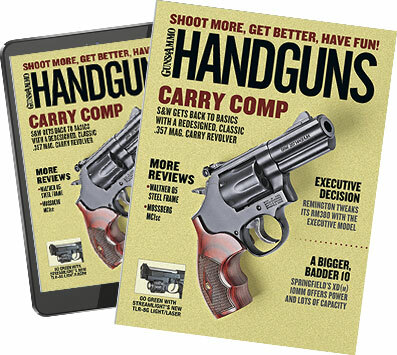 The 315NG quickly became the author's favorite as it was reminiscent of his Model 12, but he found the other two a bit painful to shoot with magnum loads and recommends .38 +P in the 386NG and .44 Specials in the 329NG for practice.